Choosing the right wall unit for your home is an important decision. 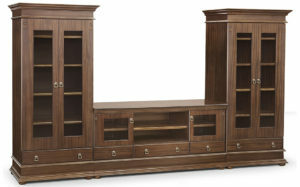 The wall unit is a big and beautiful piece of furniture that makes a statement piece. You need to keep in mind the styling of your home, your personal taste levels, the equipment that you want to house and of course the quality you want. At UFO (United Furniture Outlets) we can accommodate and guide you in all these buying decisions, ensuring that you are 100% satisfied with your piece of furniture.